Chesterfield skatepark was designed and built by Freestyle, opening in 2009. 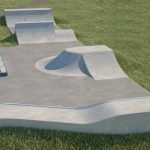 It is an all concrete park that features mainly street based obstacles with some transition focused stuff as well. 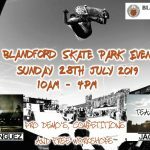 The skatepark starts on one side with a mini ramp with one closed side and the other side opening up into rest of the park with a hip and a staggered ledge on top. Following this is an flat, open area with a curved flat bank surrounding it that leads up to the top level. Along the top edge there is an extension, rail and a pump bump, and leading up the back side are two hubbas and a rail. Then on the back side of the skatepark is a large taco acting as a return ramp. 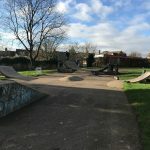 Chesterfield is a nice local skatepark with something for everyone. 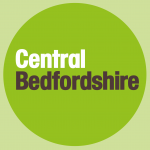 Whether you are learning the basics or fine tuning those harder tricks you will manage to have a great session here, definitely worth checking out. Chesterfield train station: Exit Chesterfield station onto Corporation Street and head south crossing over the main road and continuing onwards until St Marys Gate. Once here turn left and follow the road south until the roundabout and then take Markham Road west and a quck left onto Hipper Street. Follow the road along and cross over the river and Chesterfield skatepark will be in sight. Ravenside Retail Park bus stop: Exit the bus onto Park Road and follow the river east until Chesterfield skatepark is in sight.